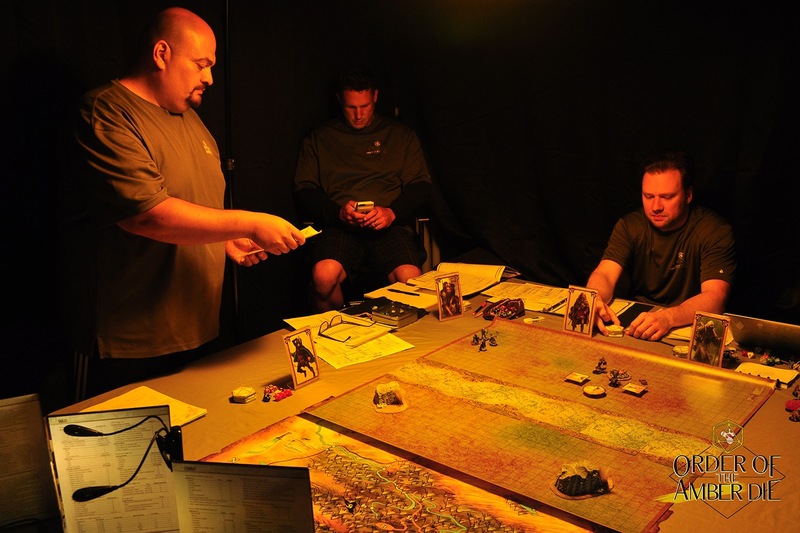 The folks from the Order of the Amber Die are churning through the Pathfinder Playtest. 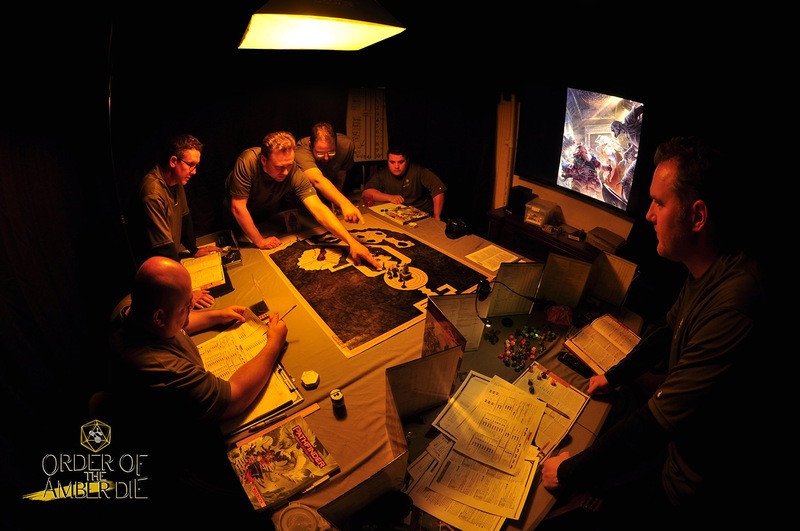 Here is the next report from their table as they play through the second chapter of Doomsday Dawn! If you intend on playing through this adventure, maybe wait to read this part after you're done, because there are spoilers aplenty in this blog post! After our initial experience in part one of the Playtest, we were eager to employ some of the already released errata and ride headlong into part two. Discovering a countdown clock was on our Pathfinder bucket list for a while now, so we dialed up some lighting to match the southern continent, and prepared to set out on a cross-country trek. In typical OAD fashion, we tapped a live NPC to play our animal companion, and our GM rendered another one of those maps that made us scared to even put our hands on. 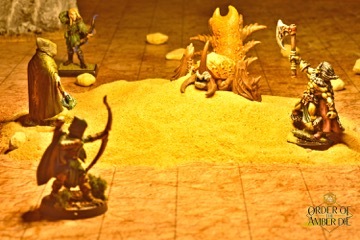 To better craft a party suited to what we were allowed to know about this section of the playtest, we opted away from our standard method of playing iconics; instead, we drew upon inspiration from one of our past campaigns and created an entirely wilderness-oriented party. 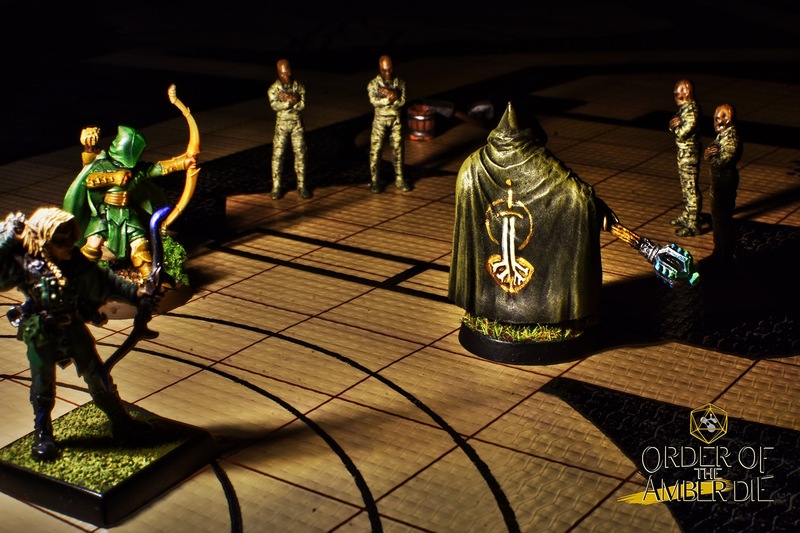 The party was given the same name as their predecessor, The Lost Arrows, who consisted (then and now) of four companions well accustomed to outdoor adventure. What we didn't know when we initially answered a request in Kelmarane, was that we'd have to navigate a tomb complete with traps and confined spaces. After an anxious mission briefing, we were confident we could at least beat our opponents—the Night Heralds—in a race across Katapesh to the tomb. Highlights From "In Pale Mountain's Shadow"
While traversing the slopes of Pale Mountain, we were ambushed by a classic foe—a manticore—that had everyone eager to see how the beast would perform with its new makeover. When our GM landed six out of his first eight tail spikes (including two critical hits and a nasty new ability that pinned our barbarian in place), it was already time to pull out the stops. That sleep arrow listed above? Yeah, Sean pulled it off. Each character had their moment to shine during part two; when it came to the barbarian, the playtest rules felt right at home alongside our favorite iterations of the class over the years. Gnolls twice attempted to swarm Ithilian with their pack attack ability, but his raging damage numbers quickly turned whack-a-mole into wreck-a-gnoll. Inside the Tomb of Tular Seft, we came across a puzzle which involved a series of elemental equations. To solve it, we felt sure we'd need a party more suited to dungeon crawling. Not so, and after drawing upon a variety of skills to produce several stellar DC 25 checks, we had the doors open and our goal close at hand. If we were to rank our TPKs across 147 adventures, PC party vs. NPC party would easily hold the record for the deadliest conflicts out there. Logan Bonner, well played. We owe you one. 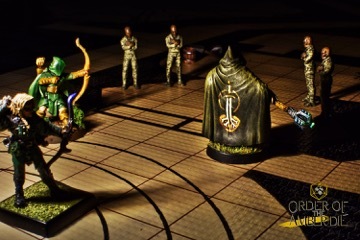 From the outset of the final encounter, it was clear that The Lost Arrows and the Night Heralds had entered into a fierce skirmish from which only one party would survive. Our ranger went down as fast as his animal companion, followed by the barbarian. Nemus, the druid, tried to buy enough time for Keleth to whisk the countdown clock to safety. Using a combination of elven ancestry, Nimble, and Fleet, the elf performed his best version of the 4x40 and tried to outrun the only enemies capable of pursuit. The Night Herald's scout pursued him out onto the ledge and into Pale Mountain's shadow, stopping to let off shots that only created distance with each miss. Just a few yards from maximum range, our GM knew the only way to deliver a hit would be a natural 20. He reached for the Amber Die itself. It did what it's done for decades, and we could only offer reverence. Follow Order of the Amber Die on Facebook, Instagram, Twitter, or YouTube. Excellent read once again. The 3 hour creation time scares me because that's a lot longer than the last one. Will you guys be implementing the new changes for the 3rd part or are you going to be sticking with the original playtest rules? Thanks Kyle! 3 hours may seem like a lot, but I think some of that may just be due to the fact that it was the first time we were playing characters above first level. I feel like the process is getting smoother as we go forward, but I guess we’ll see though, once the data comes out for part 3 and the rest of Playtest scenarios over the coming weeks. For me personally, it was a blast getting to recreate the very first 3.5 character I ever made—the barbarian Ithilian Nightfall—using the Playtest rule set! One thing I liked about the barbarian: it felt distinct from the fighter. As far as updates go, we plan on using the most updated rules at all times. And speaking of part 3, we wrapped it up already (report coming). Can’t wait to see what part 4 has in store! Our group managed to beat the Night Heralds (whom actually has a 5th Monk member to compensate for a 5th player) there, with 2-3 days to spare thanks to utilizing the Camels for traversing the 80 mile long trek to the base of the mountain, and getting lucky on several checks that would normally take hours to remake (but didn't since they were successful the first time). They didn't bother going down the tomb any further (I ruled that the locks on the doors down below were Expert tier quality, and nobody on the group was Expert in Theivery, so it was impossible to open that way). This made it so that the players couldn't open the doors down to the unexplained while also keeping true to the playtest that the Night Heralds wouldn't actually show up there in the time allotted from the adventure, though if they did manage to find a way to open it outside of Thievery, I would have probably had them show up when they succeeded, as the book suggested. 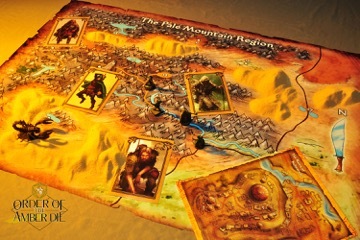 Of course, the only reason I went the route I did was because of what the players did prior; they managed to make "Friends" with Zakfah and his pack, with Zakfah still looking for treasure in the area. The Night Heralds could have probably encountered them after realizing the PCs beat them there, interrogated them for information (one of them could probably speak Gnoll, going in-line with the adventure's suggested language selections), and manage to track the PCs back to the town of Kelmarane, thereby still allowing the encounter to take place (though I would have to effectively homebrew the battle map for which the encounter takes place, since there isn't really one there for that area). Depending on what we do tomorrow, this encounter could still happen, but this would be well beyond the scope of the playtest's expectations, and as such, the adventurers we had killed the base adventure, as the Countdown Clock is already in the Order's custody by the time the Night Heralds would arrive. Wow. That’s a brutal way to go down! Thanks for sharing, it's great to be able to compare stories of how things played out--congrats on getting the clock! I hear you about going outside the scope of the playtest, this adventure was one that I'd love to revisit at some point. 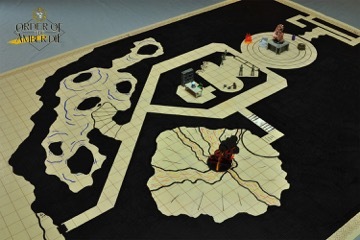 The labyrinth seemed like an awesome journey to create, with miles of passageways and traps. Great times, and looking forward to the rest of the playtest! You got it Porridge, another awesome TPK story for the Order's archive! Our mantra when it comes to party construction is "There are no absolutes in the world's oldest fantasy role-playing game," and I guess it was proven again here if that's what people are saying about parties with clerics in PF2? The most successful party we ever had (from 1st to 21st level campaign) was actually all martial characters. When it comes to the playtest, I enjoyed just watching the cleric be able to fire off so many shots and still be useful with healing--he was all over the battlefield with that 40ft movement--which essentially saved him actions at times since he rarely had to spend two actions to reposition himself. I just read through your report—really interesting read—very detailed! I liked hearing about the manticore encounter in particular, as it was the most memorable encounter for me personally (other than the final encounter PC vs NPC TPK! ), and it sounds like it was a standout encounter for your group as well. Reading about the barbarian using javelins reminded me of Ith throwing javelins at the manticore with his foot pinned to the ground by a manticore spike that critically hit, lol. That image will always stick in my head. Reading about the manticore engaged in both airborne and land based combat was interesting, and I literally laughed out loud at him trying to hide in the rocks, failing with a natural 1, and cursing because he stepped on some rocks he didn’t see, hahaha! Lastly, decapitating the manticore, and then the barbarian later tossing it at the gnoll Sergeant at their encampment, as part of an Intimidation check, barking at them in gnoll language, was a really nice touch! It was. I should have let them succeed on the action alone (rule of cool and all that), but I played it by the rules as the playtest required, and rolling a 2 (with all of the circumstance bonuses and aids in place) still made it a failure. Thanks for reminding me that the Manticore Spikes pin creatures to the ground on a critical hit. I think I critically hit a couple people with those spikes during the encounter (namely the Sorcerer), but forgot to implement that rule. Whoops! I don't think the players were in any major trouble anyway, they had plenty of resources to deal with it. Thank you sharing again!! I really enjoy your approach to the game and your willingness to share your experiences. Party on! How did the party spend 31 Hero points ? O_o What are your criterias to hand Hero points ? I don't understand how a party could do so many heroic deeds. Here's what the players wanted me to mention: Despite the number of Hero Points, we still ended up with a TPK. Elorebaen, good to hear from you. Thanks for mentioning the willingness to share, that's been the part for me that took some getting used to (having my game decisions out in front of the community). At least this time there was less pressure playing an animal companion. Sorry team, I did what I could to hold back the Night Heralds!